I have this obsession with the cake balls. Of course, I love the oreo balls. But these below are quite possibly my most favorite Christmas ‘cookie’ ever. Cookie dough truffles, what what! This dough! There are no eggs in this, so feel free to eat the entire bowl like I may have done. Just make sure to leave enough time (and ingredients) to whip up another batch. I actually liked this dough more than regular cookie dough. Doesn’t it look exactly like cookie dough? It’s so creamy and delish! I dipped these in milk chocolate. I’m sure they would be great dipped in any kind of chocolate. But dipped in milk chocolate? They really taste like a cookie. Incredible. I don’t really have any more exciting words to say. Besides, my mouth is still full of cookie dough. The only way this will make you sick is if you eat too much. Since there are no raw eggs, it is very easy to do. Eat up! In a large bowl cream butter and brown sugar with an electric mixer at medium speed until creamy. Add vanilla. Gradually beat in flour and add milk. Add chocolate morsels, mixing well. Shape into 1-inch balls. Place on waxed paper; chill 2 hours. Since the dough is sticky, roll your fingers into flour if necessary. This will make it easier to roll. Melt the chocolate chips or disks in a double boiler. Using 2 forks, dip cookie balls into candy coating to cover. Place on waxed paper and chill to set. Store in the refrigerator for at least 1 hour. Guilt + Full Body Workout. I made these for a friend’s Halloween party and they were a huge hit! I had a bunch of eggless cookie dough leftover, so I recently used some of it to make cookie dough ice cream. SO GOOD. The pumpkin and oreo versions look equally as delicious! Oh goodness, what are you trying to do to me here? Cookie dough addicts beware. This seems like it would be a great food gift in a little box. Hmmm, ideas! Oooo, that looks WAY too good! Pingback: The Latke Queen | What's For Dinner? Pingback: my addition to the cookie dough craze. | girl meets life. ok girl I have a total cookie crush on you!! This is a fantactic idea!! 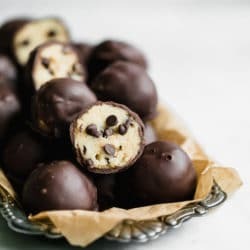 I like you have made a variety of cake balls and I just recently had oreo balls(using the word balls alot makes me laugh like I’m in 6th grade)! but chocolate covered chocolate chip cookie balls is like the first time you cover a spoonful of creamy peanut butter with magic shell and put it in the freezer for 5 mins and discover you created a master piece!! I’m totally serious ahahaha! I am making these ASAP and blogging them so everyone can share in the magic of cookie balls!! I made the same but used honey graham.cinnamon cookies…. YUM! Just made these tonight in the snack room of my dorm! Easy to make and SO AMAZING. It’s a good thing we made a double batch so there was more to share :) Thanks for the great recipe! My best friend and I send each other weekly goodies in the mail ever since she moved to LA. I was wondering what the shelf life on these might be and if they need to be refridgerated? Hey there, just Stumbled onto your site and wow… Awesome! Just wanted to know if you’ve tried to batter dip and fry these sweet little things. And if not, would it work? I love these. I’m making them again for a pot luck “Friendsgiving” party I’m attending tomorrow. I probably going to make some of them white chocolate covered. Thanks for the great recipe! These look delish and adorable! I made your pink or strawberry (don’t remember) cake balls for vday and they were such a hit! Anyways, do you think I could sub almond milk or a thick greek vanilla yogurt for the sweetened condensed milk? I never bake or cook with it..so I wouldn’t know what to sub or if it’s possible.. I’m sensitive to some dairy, so I don’t know if I could handle it lol ..thanks! i am sure they are delicious, i am just not a fan of dates and cashews. they taste wonderful, but to me, they taste nothing like cookie dough! thanks a bunch for your tips! i didn’t realize the condensed milk was non perishable.. i did want something cookie-like so i went with your original recipe. i’m bringing them to my sis’s bday dinner :) they are currently chilling in the fridge and they’ve gotten rave reviews from taste testers so far! made these last night…I sort of needed to be alone to eat these…yeah, they are that good! I’d like to make these for a cookie exchange at work, but I can’t make refrigeration-needed cookies. Do these need to be kept cold? Or are they good at room temp after initially setting the chocolate? Is there a way to make these so that they do not need to be refrigerated? I want to make these as wedding favors for our wedding… want to make them a week in advance…. and store them at room temperature in their favor boxes… not in a refrigerator…. ideas?